December 4, 2018, Peacefully, at Rylands Nursing Home, Ballymena, late of 10 Old Grange Avenue Ballymena, wife of the late David and devoted Mother of the late Rhonda, sadly missed by son Alastair, daughter-in-law Jenni, and grandchildren Kyle and wife Anna, Glenn and wife Emma, Kathryn and Connor, and great-granddaughter Holly. Funeral service will be held on Thursday 6th December at 12.30 p.m., in Harryville Gospel Hall, Larne Road, Ballymena, followed by interment in Ballee Cemetery. Friends welcome at 37A Ballymacvea Road, Kells, Ballymena. Family flowers only please. 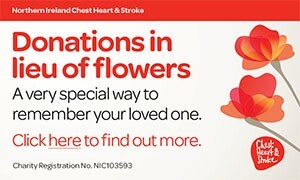 Donations in lieu of flowers, if desired, to The Lord’s Work Trust c/o James Stevenson and Son, Funeral Directors, 30 Cushendall Road, Ballymena. I am sorry to tell you that Janet HAMILTON has passed away.